Below is a list of the FAQs which we have received and answered. If you have a question which you feel should be on this list, please submit it to us at faq@chelmsforddogassociation.org. Q: Why are the FAQs so bare right now? A: Questions (and answers) will be added as they are presented. The Dogs FAQ will be updated as time allows. 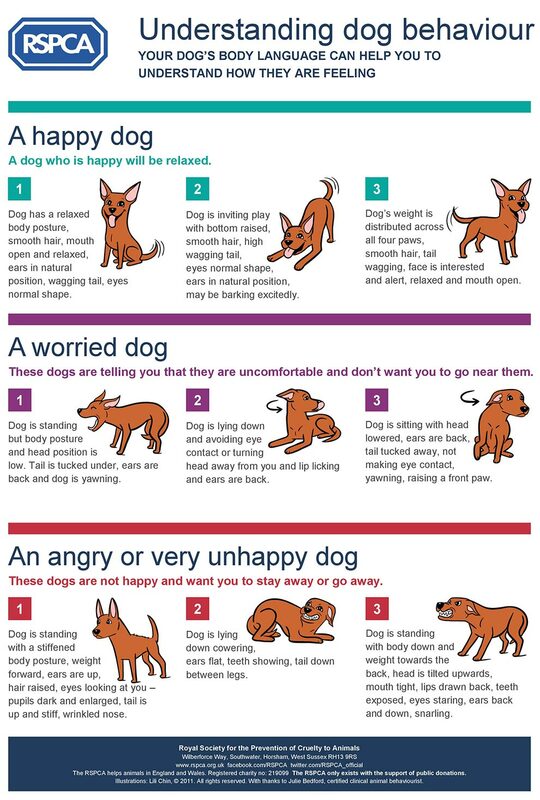 Your dog’s body language can help you to understand how they are feeling. TDG: Is My Dog Happy? 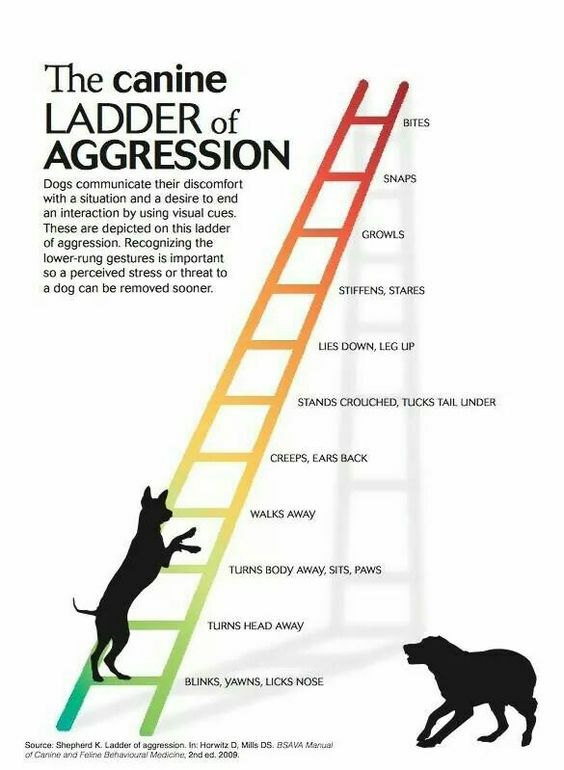 The Ladder of Aggression is a depiction of the gestures that any dog will give in response to an escalation of perceived stress and threat, from very mild social interaction and pressure, to which blinking and nose licking are appropriate responses, to severe, when overt aggression may well selected. 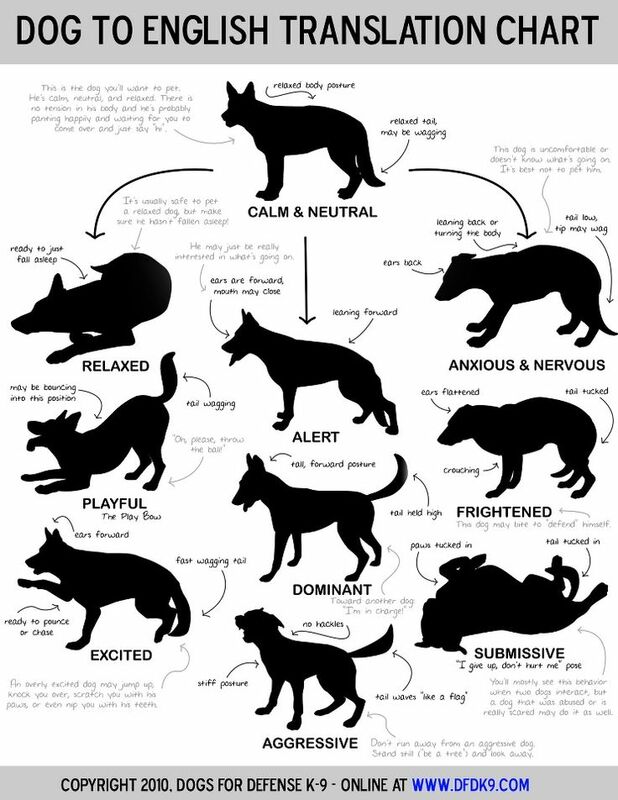 The Ladder of Aggression is a depiction of the gestures that any dog will give in response to an escalation of perceived stress and threat, from very mild social interaction and pressure, to which blinking and nose licking are appropriate responses, to severe, when overt aggression may well selected. The purpose of such behaviour is to deflect threat and restore harmony and the presence of appeasing and threat-averting behaviour in the domestic dog’s repertoire is essential to avoid the need for potentially damaging aggression. The dog is a social animal for whom successful appeasement behaviour is highly adaptive and it is used continually and routinely in every-day life. It is most important to realise that these gestures are simply a context and response-dependant sequence which will culminate in threatened or overt aggression, only if all else fails. Contrary to persistent misinformation, the gestures identified are nothing to do with a purported dominant or submissive state relative to companions. In all dogs, inappropriate social responses to appeasement behaviour will result in its devaluing and the necessity, from a dog’s perspective, to move up the ladder. Aggression is therefore created in any situation where appeasement behaviour is chronically misunderstood and not effective in obtaining the socially expected outcome. Dogs may progress to overt aggression within seconds during a single episode if the perceived threat occurs quickly and at close quarters, or learn to dispense with lower rungs on the ladder over time, if repeated efforts to appease are misunderstood and responded to inappropriately. As a consequence, a so-called ‘unpredictable’ aggressive response, without any obvious preamble, may occur in any context which predicts inescapable threat to the dog, when in reality it was entirely predictable. (Shepherd, K 2009. BSAVA Manual of Canine and Feline Behaviour, 2nd edition.pages 13 – 16. Editors Debra F. Horwitz and Daniel S. Mills).